To let your kid open up and feel his own energy, you can take him to the Kidergy. 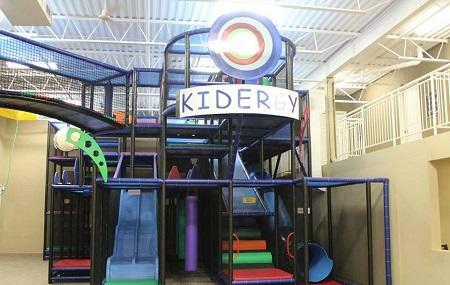 It is an outstanding indoor amusement zone where your kid will get ample scope to enjoy. In this facility, your child can enjoy the amenities such as slides, indoor playground, party rooms and much more. Not only a safe and vibrant playing area but as a party venue also, this facility is utterly cool. There are a lot of party packages available in this venue from which you can avail any suitable one such as PJ Bash Party, Kidergy’s Play Party, Kidergy’s Breakfast Party and much more. Bring your child to Kidergy and let him enjoy his childhood at its best. Clean, safe and fun! Attended a child and me yoga class with my 1 1/2 year old. Great time for my little one and yoga with Ingrid was awesome. We will definitely go again! There are better indoor play places in the area, but this one is good. Good place to bring your kids to spend some energy. Kids love this place. The owner is awesome and the seating area of parents are high end and lots of room too !